Looking for an easy and delicious Vanilla Tea Cake Recipe? 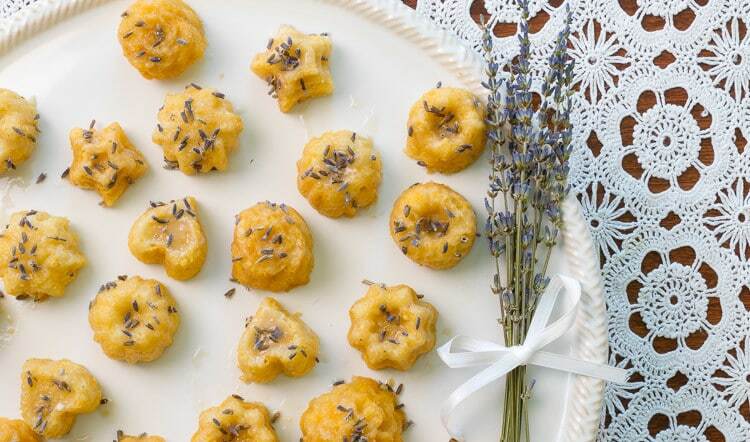 These Vanilla Mini Cakes are made even more delicious with an uncomplicated Lavender Glaze. In a mere 6 weeks, my baby girl graduates from college and I'm not sure how that has happened. It's one of those things that I just can't wrap my head around. But nevertheless, it's happening, and I am bursting with pride. She takes the MCAT in 2 weeks (all good thoughts welcome), graduates in May, has a job lined up for the year between graduation and med school (fingers crossed) and basically has her stuff together. But, then again, she always has so we are not surprised. With family and friends in town for her graduation, we are planning a wee gathering. We will have most of the food catered, but since I love to bake (and eat) desserts, I will be doing all the sweet stuff making. I'm partial to finger food type recipes that will be easy for me to make ahead and transport, and this Vanilla Tea Cakes Recipe finished with a lavender glaze, fits that bill perfectly. And while these will be perfect for our graduation party, these easy to make tea cakes would also look lovely on your Easter table or for any celebration. 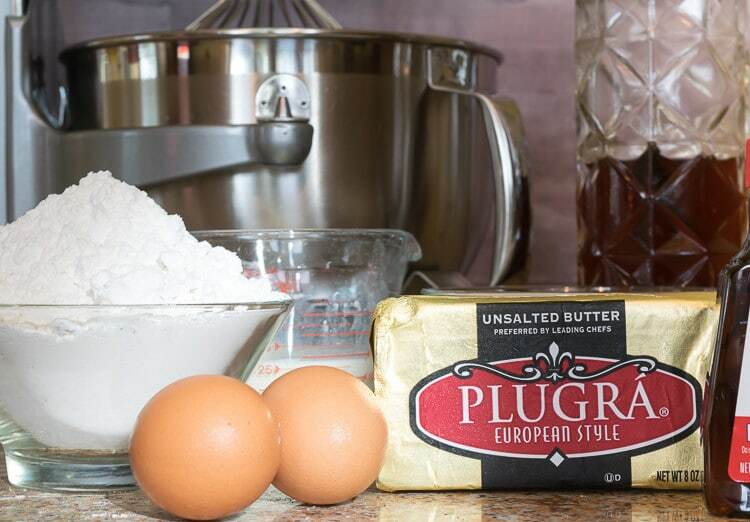 Since these simple mini-cakes are flavored predominantly by butter and vanilla, I went with a higher quality, European style butter like Plugrá, which is slow-churned for less moisture, leading to a more flavorful and better-performing butter. So, let's talk butter for a minute. What is the difference between American and European style butter? In a nutshell, it comes down to the fat content. European style butters, so called because of the method and length of churning common in Europe, produce a butter that has at least 82% butterfat. That higher fat content, along with fermenting or added cultures, results in a creamier, more flavorful and often tangier butter. American style butters aim for a butterfat content of at least 80%, so they have more water. Without the cultures, they are less tangy and basically a more neutral flavor. In all honesty, I use both types of butter for different purposes. When I am melting butter to sauté my onions and garlic for a soup or I’m buttering my cake pans, I pull my standard American style butter from the fridge. But, when I am making something in which I want the butter flavor to shine, I opt for the higher fat content, European style butter which results in creamier, more flavorful baked goods and sauces. And while most premium butter brands are imported, I like to use Plugrá as it is made with real milk from American dairy farms. Further, Plugrá contains no artificial ingredients or added growth hormones, both of which we actively avoid. And unlike the not too distant past, I don't have to traipse across town to my local gourmet shop to find European style butter…Plugrá is located with all the rest of the butter in my local Publix grocery store! And, because today is just a great day, you can get $1.00 off of your Plugrá purchase by popping over here for a coupon! You could very easily make this Vanilla Tea Cake recipe and leave them as is, but this easy-to-make Lavender Glaze complements the buttery, vanilla-y flavor of the mini cakes so nicely. And if you are feeling especially fancy, sprinkle a few culinary lavender buds over the wet glaze. This touch would be especially lovely during the spring! Even my hubby, who is a true, nothing fancy, ‘just meat-and-potatoes-please' kind of guy popped a lavender glazed vanilla teacake into his mouth and exclaimed…'Oh My….‘, in the good kind of way. These Vanilla Mini Cakes are made even more delicious with an uncomplicated Lavender Glaze. 2. Using a good-quality bake release spray, make sure you get a good coat of in all the nooks and crannies of your tea cake pan. 3. In the bowl of your mixer, blend butter and sugar together and beat on high for 2 minutes until fluffy. 8. Tap your pan against your counter a couple of times to force the batter to level and to force the air bubbles to the top. 9. For the teacakes, bake for 20 minutes. If using a cakelet pan, bake for 25-28 minutes...until toothpick comes out clean. 10. Let cool for 5-10 minutes on cooling rack and then use a serrated knife to trim any dome on the bottom of the cakes that might result from baking. 11. Invert pan onto cooling rack and let the teacakes cool for 15 minutes before glazing. 12. Drizzle lavender glaze over tea cakes. 13. Before glaze hardens, sprinkle with lavender buds. While tea cakes are baking, bring milk to a simmer over medium heat. Remove from heat and stir in lavender buds. Put lid on the saucepan and set aside for at least 20 minutes. Pour lavender milk through a fine wire-mesh sieve into a bowl. Add half of the lavender milk to the powdered sugar and vanilla and mix to combine. Add lavender milk by teaspoon at a time until a nice, syrupy consistency is reached. I always like to have an inventory of reliable, go-to recipes on hand for special occasions, and this tea cake recipe falls into that category. I hope they make their way onto your table soon! Bookmark this page or pin the following image to reference this Vanilla Tea Cake Recipe in the future. The lavender glaze of these cookies really sets them over the top! I already can’t wait to make them again! Thanks Tayler…I think so too. Just an unexpected something-something.